A punk may seem bizarre and outlandish to many, though the fact remains that punks represent a bold and unusual style that is simply loved by many. Punks are identified as rebellious and anti-establishment. They have a culture of their own, which thrives in its unique individuality, and doesn’t take into account the set norms of society. Punks are odd and atypical and they simply love being that! Becoming a punk is all about setting defiant fashion rules and donning an equally bold attitude. In case you are smitten with punks and want to be one of them, read on to know how to become a punk. Following the punk fashion is one of the first things you will have to do if you want to become a punk. Some of the common types of punk clothing are denim, leather, leopard print, strips, tartan, plaid and camouflage. T-shirts printed with snarky logos and band paraphernalia is a common dress code of the punks. Pants with many zippers or safety pins are also in for punks. Since being a punk is about being non-conformist, anti-establishment, and staying clear of the accepted norms, your shoes have to be chosen accordingly, as they are extension of the statement that you are trying to make. Name-brand shoes will not work to a punk’s advantage. Combat boots are more like it! While women punks mostly wear men’s shoes, they can also try pumps and cowboy boots. Your hair also need special treatment as punks style their hair in creative ways. Spikes and Mohawks are quite popular among them. Also, vibrant and unusual colors can be used to complement the unusual style statement that punks make. Other hairstyles that can be tried to look like a punk include 80’s hair, big hair, shaved hair and devil locks. Piercing and tattoos are also identified greatly with punks. 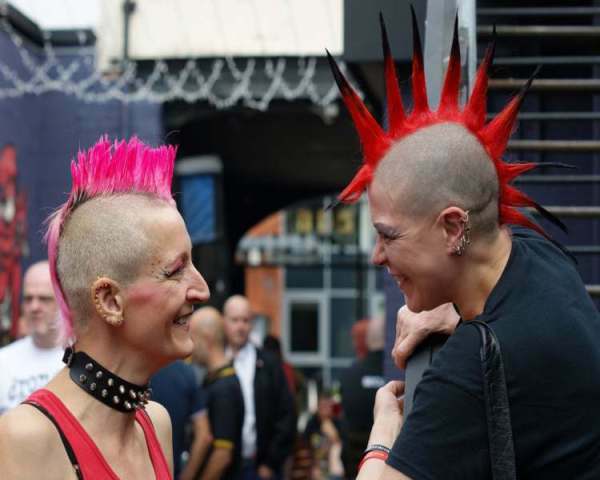 Although, it is normal to find other people sporting tattoos and piercing their body parts, the punks combine it with fitting clothes, hairstyle and body language to look odd and usual. Go for tattoos and piercing extensively over your body. You just don’t have to work on your style; you have to work on your attitude as well. Listen to punk rock music and try to learn it. The punk style mostly centers on the rock music genre, it is therefore better to understand rock music and also learn it if possible. Punk Rock can be traced back to the 1960s and you need to love this music, if you want to follow the punk culture. Try to find other punk people and also hang out with them. The best way to be a punk is to watch other punks and learn from their style. It is very important to find out like-minded people, more so when you want to become a punk. Go to punk concerts and clubs where you will get the opportunity to meet such people. It will also give you an opportunity to get involved in punk music.